What do smart business owners and managers need to know about time management? As business owners, we often find that there aren’t enough hours in the day and our time is spent working in the business, ensuring that things are running smoothly rather than working on planning for the future to determine the future direction of the business. PKF adviser, David Jamieson will help you identify the roadblocks you’re facing and through the implementation of his techniques, you’ll find you buy yourself more time back to spend working on the business and with your family. PKF Australia is a group of like-minded, independent firms focused on providing quality service to decision makers in business. Core services include audit and assurance, business advisory, taxation, recovery and insolvency, corporate finance, and wealth creation. I2N Hub Williamtown is providing an opportunity to network and learn from some of the most influential business people in the region. The event will incorporate refreshments, a Q&A session and informal networking. 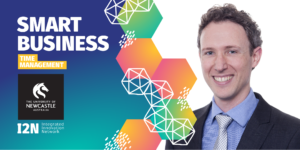 The Smart Business series presented by David Pamieson (Partner, PKF) provides the opportunity to enhance your overall business acumen and develop your business.